This is one of my colorful stained glass painted pieces. I call this one: "A Little Bit of Gold" because there is one section that I mixed a blend of "sparkling gold" and yellow ochre color in, (which you can see in the closeup photo here) and that's where I took my inspiration for the title. 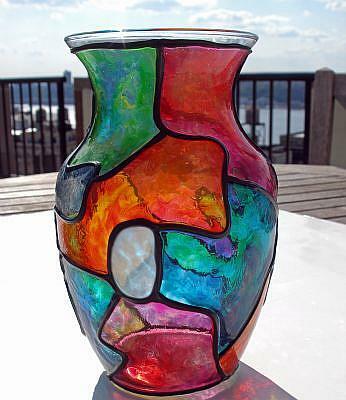 I would consider this stained glass painting method "cold" glass work. Some of the colors I used to create this are: Turquoise, Orange Poppy, Kelly Green, Citrus Yellow, Magenta Royale, Ruby Red, Sparkling Gold, Yellow Ochre, Amethyst, Bright Blue, Slate Blue and White. 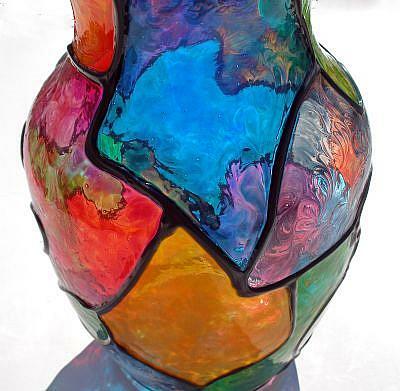 I wanted this piece to be eye-catching, and to add a bit of a "WOW" factor to any room. I was also thinking that in most cases a vase with flowers in it, usually the flowers take center stage, and get all the attention for their beauty.... I wanted this particular vase to be beautiful all on it's own without the added beauty of flowers. 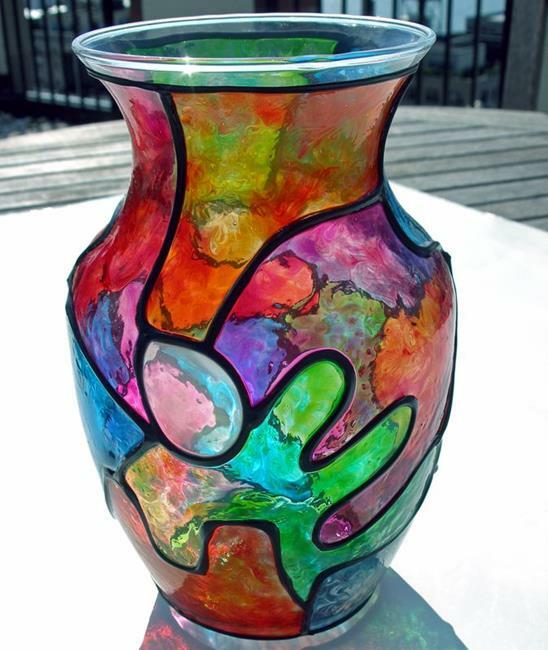 This vase would look stunning just sitting on a windowsill (with or without flowers) and with the sun's rays shining through all the colors. The colors cast amazingly gorgeous colorful shadows, when the sunlight shines through them (which you can see a little bit in the photos here)! FIrst, I lay down the organic, black "liquid leading" outlines, and let them dry overnight. Then, I can start to fill each individual section with color, and I usually do this meticulously with a toothpick(!) blending and spreading the colors, making sure to go all the way to the edges of the black outlines, and popping any little air bubbles that may occur along the way. Then I let the piece "cure" or dry for about a week. 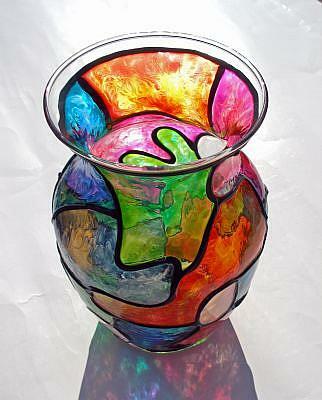 The colors have a beautiful translucency or iridescence to them and this piece would make a fantastic gift for anyone. I have signed it on the bottom. I show several photos here from differing angles, since it looks quite different depending on which angle you view it from. I also include a closeup view for detail of color and texture.